It would always be nice to control the things that start with our smart phone. Just like we have MSCONFIG for Windows we always wanted a similar kind of thing for Android devices also. And that is what XDA Forum member has come up with. Defim has published a fully loaded BootManager which lets your control the bootloader. In simple terms that means that you control the Apps your Android smart phone loads at startup and reduce the start up time drastically by disabling the unwanted Apps. The BootManager however works only with ROOTED Phones and with Wanam Xposed Framework installed on your smart phone. So before installing the BootManager be sure to download and install the Xposed Framework module from here. 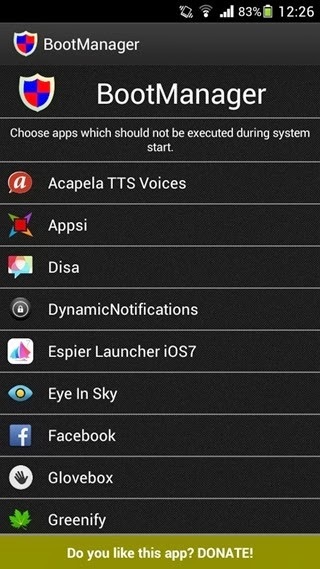 Once you have installed the Wanam Xposed Framework, head over to the Google Play and download the BootManager. When you run the app for the first time, it will list down all apps set to run upon every boot of your smart phone. You have to just tap any App that you want disabled from startup entry. The BootManager will then highlight the disabled App in RED which will mean that the App wont be booting during your smartphones startup. Also please note that the free version of the App does not list or give access to system Apps set to boot with device startup as the free version lets you see and manage only user-installed. To control all boot items and system Apps, you will need to make an in-App donation. Can you give a brief tutorial on installing and using boot manager. I am not understanding what to do next after installing.